CAN Automotion introduces an enhanced version of HMS’ extremely successful USB-to-CAN interfaces marketed under the IXXAT brand. Existing and new features in the IXXAT USB-to-CAN V2 interface offer significant advantages for users. For example, the USB-to-CAN V2 uses powerful hardware and connects over USB 2.0 at 480 MBit/sec, enabling very high data throughput with minimum latency and lower power consumption, which makes the interface suitable for very demanding applications at maximum bus load and CAN bit rates up to 1 Mbit/second. The IXXAT USB-to-CAN V2 interface retains the advantages of the existing USB-to-CAN including excellent robustness for long-term use in harsh environments, very easy operation and a cost-effective price. The existing versions of the proven IXXAT VCI and IXXAT ECI drivers support the new USB-to-CAN V2, also permitting drop-in use in existing applications without changes to software, even when changing between different interface types. 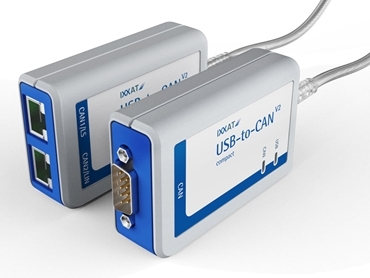 The IXXAT APIs for CANopen and SAE J1939 also support the new USB-to-CAN V2 device family. The USB-to-CAN V2 is available in different variants with either one or two CAN interfaces based on ISO 11898-2. In the USB-to-CAN V2 compact, the CAN connection is implemented as a sub-D9 plug or alternatively as an RJ45 connector. The versions that carry two CAN interfaces are connected via RJ45 connectors. Adapter cables to sub-D9 plugs are included with the devices. Additional options include galvanically isolated CAN interfaces, bulk variants, and support for ISO 11898-3 low-speed CAN and LIN. The new housing design supports creation of customer-specific variants branded with the customer logo. Another new variant is the IXXAT USB-to-CAN V2 for embedded use, which is designed without housing but with a slot board and adapted USB cable for installation into a computer.